Distance Learning Trends in 2014, part 1 Dec 10, 2013 As the modern face of education, e-learning continues to grow at an astounding pace. With more and more students and learners turning to affordable, conve.. Leadership course online. Develop and expand your leadership skills! Leadership skills are needed in all facets of our society: business, politics, religion, youth services, and leisure industries, to mention only some. This new course is relevant to all of those areas, developing your understanding of, and capacity to apply leadership skills. This level 3 course has been accredited by the CMA - The Complimentary Medical Association. On completion of any qualifying module, you can join as a "Fully Qualified Practitioner" and be entitled to use the post-nominal latters "MCMA" after your name. ​CMA Full Membership is a privileged position and the fact that you have been accepted for CMA Membership demonstrates that you have a clear commitment to standards and professionalism. CMA Members in all categories are recognised as the elite in their field. Describe the nature and scope of Leadership. Determine the qualities which are required in a leader, in different leadership situations, including the workplace, recreation industries and developmental applications. Manage interpersonal relationships in support of effective leadership. Communicate leadership messages effectively to those you lead. Explain methods that may be used for effective team building by a leader. Select appropriate thought processes to follow in order to deal with different leadership problems. Explain the significance of leadership for a specific project or event. Identify the role and tasks of leadership, in the same project. Integrate factual information with theoretical information to derive a sensible solution to a leadership problem in a sensible timeframe in the same project. Plan the development and building of the team to achieve these aims in the same project. Plan actions for sustaining and motivating the team to achieve the aims. Provide information on the plan of action to organize the event. Responds by sending a message …and so on. behavioural factors (how we speak, our body language – gestures, expressions etc). Any or all of these factors can serve to enhance or detract from our communication effectiveness, by either affecting the way a message is encoded (what words, gestures, and actions we use) and how it is decoded by the other person (what meanings they draw from it). For instance, we might choose the right words, have a positive, cooperative attitude, and be in a cheerful environment, but might not get through to the other person because he is preoccupied with a personal problem or because he feels unwell that day. On the other hand, we might be shy, speak awkwardly and not clearly express our ideas, yet receive a positive, cooperative response because the other person is from a culture where indirectness and subtlety are appreciated, and shyness in a woman is considered a virtue. In the previous lesson we discussed the role of perception (a psychological influence) in what and how we communicate. Here, we consider other factors as well. When a person is speaking, the listener is not only concentrating on what is being said, but also how it is being said. A break down of oral communication; Many communication experts assign greater importance to non-verbal communication in ordinary conversation, than what they assign to verbal communication. Albert Mehrabian suggests in his book Communication Without Words that an oral message is 55% body language, 38% the way it is being said and 7% actual words spoken. So at all times, you must be aware of your body language and ensure that it supports or reinforces what you are saying. For instance, your body language does not reinforce your message if you are talking about being sincere while behaving as though you are distracted, or if you are suggesting that a team member be more patient but your gestures and tone of voice communicate your own impatience with his many questions. Body language is sometimes misunderstood as a universal code in which specific signals communicate specific messages. This simplistic view leads to incorrect assumptions about a person’s frame of mind. The key to reading body language is to be aware of three factors: clusters, context and culture. Clusters are groupings of signals that can help you more accurately read a person’s body signals. If a student says, "Yes. I understand that" while looking alert and directly at you but with his fingers over his mouth, you might decide that on the basis of his words and eye contact, he does understand. However, if you look at the group of other actions (the covered mouth, looking down as he speaks and fidgeting with his pen) this cluster body language signals indicates that he is not telling the truth. Context is the environment or situation in which a person is communicating. Crossed arms may signal that the individual is not listening or even rejects what you are saying but it could also mean that she is cold. One should consider the context in which the body language occurs. Culture is a very important influence on communication and must always be considered when you deal with clients from different cultural backgrounds. A signal in one country may mean something else in another country. A classic signal is the thumb and pointer finger touching in a circular shape. For westerners, this means "OK" but it may signify an insult in other cultures. When considering culture, also consider workplace culture. In a workplace where hierarchies are well established and reinforced through workplace behaviour, body language that might suggest timidity or passiveness in another workplace culture might really be signifying respect or deference to authority. An invaluable guide to the theories and practicalities of leadership – this fascinating in-depth guide helps to explain what makes a good leader and how the skill can be developed. 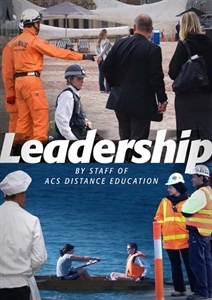 Leadership eBook course online. What makes a good leader? Is it an innate personality trait or a skill that can be aquired? This book is an excellent guide to the theories and practice of leadership. It is full of interesting facts about social dynamics and examples of leadership styles. For those who are curious or in need of some leadership skills, this book will provide both entertainment and advice. Leadership is a two-way relationship and it is important to recognise this. If there are no followers, there is no leader. Leadership therefore involves the obedience and willingness of followers. Leadership is also based on good will and cooperation. Leadership can exist through force and threat, but a leader will not usually maintain this relationship for long. Leadership can also be specific to a certain situation. There are differences between leadership and power. Where leadership generally suggests that following the leader is optional, power suggests an ability to control or command others, where the person does not have the option to follow – they are either forced to follow, or are so overwhelmed by the power that they follow without thinking. When we think of historical leaders, we generally think of people that inspired others to greatness, such as Nelson Mandela or Mahatma Gandhi. If we think of people in history with a lot of power, we think of political dictators, or people such as Adolf Hitler, who had control over people without them necessarily having a choice. Power, of course, does not have to be a bad thing. In combination with high integrity, a leader with power can create the extraordinary. In the home environment, the difference between power and leadership can be demonstrated in a different way - a baby has the power to change the behaviour of his/her parents, but this influence is not the same as leadership in the family. Is there a specific personality that demonstrates that a person is a “great leader”? Whilst some personality traits lead to a natural inclination to be a leader, personality traits will not necessarily determine a person’s leadership aptitude. A leader may also have other qualities such as superior tact, superior intelligence, superior strength, superior knowledge, superior oratory skills, or superior power. Some or all or none of these can lead to attaining leadership. These things may be important, but they are not necessarily essential. It is also the ability to set new goals and reach new expectations for themselves and for the group they influence.